Let’s talk for a second about Comfort Food. As the nights draw in earlier and the temperatures drop, all I am craving right now is a properly hearty meal. And as you may know, I am borderline obsessed with trying to find sneaky ways to transform traditionally unhealthy classics into their nutritionally packed super cousins. And this veggie-laden, fibre-filled, gluten-free Mac and Cheese is no exception. Packing in 5 different vegetables, and at only 460 calories per serving, it provides 16g of protein and almost a third of my daily fibre. But perhaps more interestingly, is it’s high micronutrient content — one portion provides a huge 82% and 51% of my daily Vitamin A and Vitamin C requirements respectively. It is also high in calcium and iron too, so given that is quick to prepare and is darn right delicious, it really does tick all of the boxes. · Boil the pasta following the instructions on the pack. · Note — when you drain the pasta, keep some of the cooking water as it will be needed to dilute the thick sauce later. · Dice the leeks and onions. · Remove the stalks from the cavelo nero and chop finely. · Heat the oil in a frying pan and fry the onions and leeks until just starting to brown. · Add the smoked paprika, garlic granules, chopped cavelo nero and spinach. · Stir well and continue to sauté for another 5 minutes. · Set these vegetables aside. · In a bowl, combine the milk, wholegrain mustard and sift in the flour. Whisk together until fully combined with no lumps. · Pour this mixture into the pan with the sautéed vegetables and stir well. · Continue to stir over a low heat until it has thickened. · Add some of the cooking water to make a spoonable sauce. · Add the drained pasta to the veggies and grate in most of the cheese (leaving some behind to scatter on the top). 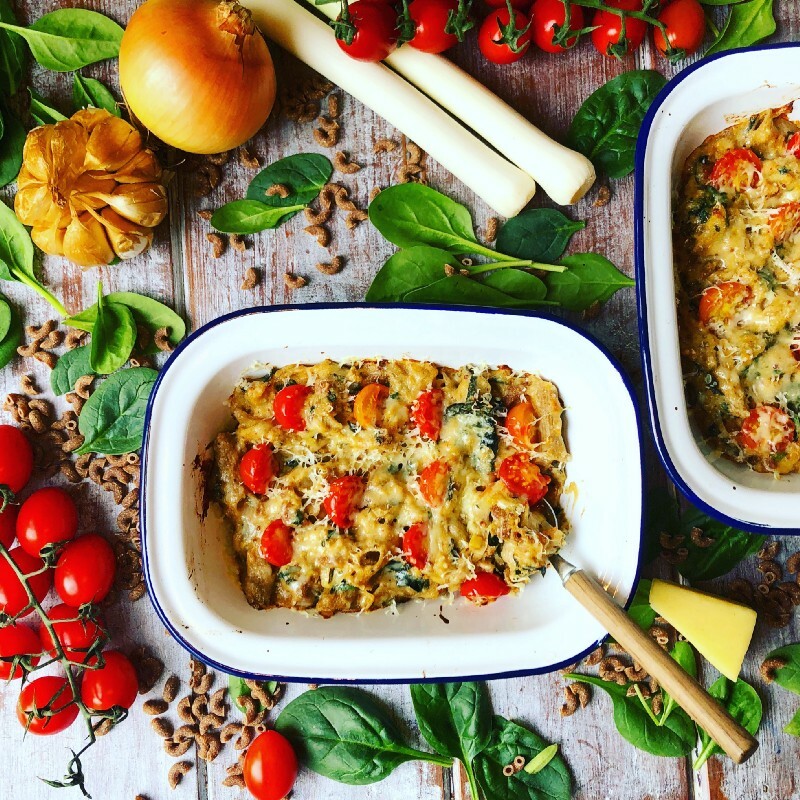 · Either spoon the pasta mixture into a large casserole dish, or into smaller individual oven-proof dishes. · Arrange the tomato halves over the top and grate the remaining cheese. · Cook for 20 minutes until nice and golden on the top, and bubbling in the middle.